Fresh-water ecology seeks to understand the relationship between organisms and their environment, and how changes in one part of the system will affect other parts of the system. Many kinds of scientific and communication skills are necessary to understand successfully the ecology of freshwater ecosystems ; therefore, career opportunities are numerous. In addition to scientific and technical expertise, fresh-water ecologists are increasingly called upon to be good communicators. Results of field and laboratory research must be made understandable to policymakers, lawmakers, and other decisionmakers. 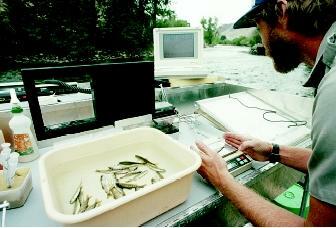 or toxicologists, also are needed to understand how aquatic ecosystems operate. Scientists with differing emphases on spatial and temporal scales are important. Soil scientists and microbiologists examine organisms at microscopic scales, whereas ornithologists , mammalogists, or herpetologists must include large spatial ranges to incorporate activities of their study organisms. Geoscientists provide a spatial and temporal (time) perspective and give insight into patterns at regional and even global scales. Other scientists help integrate information: statisticians and theoretical mathematicians assist with analysis and developing abstract models of how the ecosystem functions. All the professions mentioned above may be pursued in government agencies, with private consultants, or with research institutions such as universities. Many aquatic scientists are researchers and also educators, managers, or consultants to decisionmakers. Experts trained in both science and relevant policies are important for conserving and restoring fresh-water systems. These might be people with backgrounds in economics, law, geography, or sociology. They help scientists convey information to the public and to lawmakers. As communities become more involved in activities such as restoring populations of threatened species, maintaining vital natural resources, and conducting comprehensive land-use planning, there will be a steady need for fresh-water scientists with good communication and negotiation skills. SEE ALSO Ecology, Fresh-Water ; Fisheries, Fresh-Water ; Forest Hydrology ; Geospatial Technologies ; Lake Health, Assessing ; Lakes: Biological Processes ; Stream Health, Assessing ; Wetlands . Jeffries, Michael, and Derek Henry Mills. Freshwater Ecology: Principles and Applications. New York: John Wiley & Sons, 1995.